As of 2011, the International Space Station has had a unique onboard automaton: the humanoid helper Robonaut. Currently comprised of a torso, a head, and two surprisingly dexterous arms, Robonaut has inspired developments on Earth as well as being a portable pioneer in space. Another development is the RoboGlove, a dexterity aid which would be particularly useful during EVAs (extravehicular activities, aka spacewalks) so that astronauts could manually perform tasks that require more range of motion than the current bulky spacesuit gloves allow. No losing wrenches in orbit now! Eventually Robonaut may even practice "medicine." Though he's not sentient (yet? ), Robonaut may someday in the future be trained to perform simple caregiving operations via the telepresent aid of a doctor on Earth. "The robot could stabilize an injured individual or do nursing-level work, even on Earth," Robonaut's project manager Ron Diftler speculated. "That essentially transports a doctor's skill and presence to somewhere the doctor can't go or, in an emergency situation, where it would be dangerous for a person to go." Astronaut, nurse, mechanic, coach, and all-around badass 'bot...Robonaut rocks! 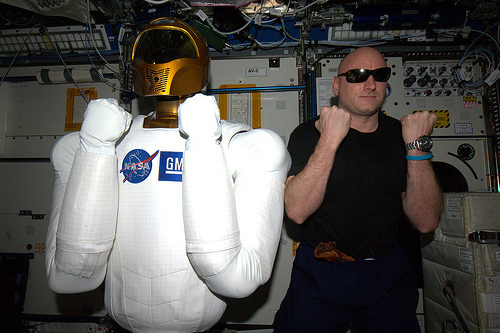 Robonaut also serves as the space station's bouncer, in case of rowdy alien invaders.